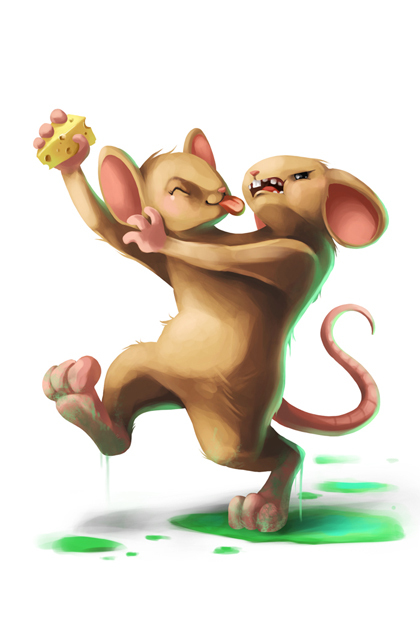 The Mutated Siblings Mouse is a breed of mouse found in the Toxic Spill, for hunters of rank Hero and above. Preoccupied with who gets the first bite of the prized cheese they just stole, they failed to take note of the rapidly-developing toxic wave encroaching on their feud. When all was said and done, the two became one! Mutated Siblings mice are especially attracted to Rancid Radioactive Blue cheese, to the point that any other kind of cheese will simply not suffice. Hydro type traps such as Oasis Water Node Trap or Phantasmic Oasis Trap are effective against the Mutated Siblings Mouse. The Mutated Siblings Mouse drops the Toxic Spill Egg during the annual Spring Egg Hunt. This page was last edited on 16 May 2015, at 19:43.